This morning we have a convergence of themes in the service. We have a word about forgiveness, a word about stewardship, and a word about peace. How might these three themes fit together? What do forgiveness, stewardship, and peace have to do with Jesus’ vision for the church and for the world? Since forgiveness is the focus of the reading from Matthew 18, we’ll start here, because forgiveness is an essential component to community, to generosity, and to peace. Peter asked the question about forgiveness, because he knew that people say and do things that can hurt others. He understood, that if you’re going to restore relationships, forgiveness is necessary. He just wanted to know how far he should go in pursuing healing. After all, the Hebrew word for peace can also be translated as healing and wholeness. When it comes to stewardship, the way we use our time, abilities, and financial resources are a reflection of our gratitude to God for God’s forgiveness, which leads to the healing of our relationships with God, with each other, and with the creation itself. Our stewardship enables us to participate in God’s mission of shalom. It allows us to share in God’s work of bringing wholeness into a fragmented world. Jesus expanded on his word to Peter about forgiveness with a parable. This is a story about a person who doesn’t understand the relationship between being forgiven and forgiving. 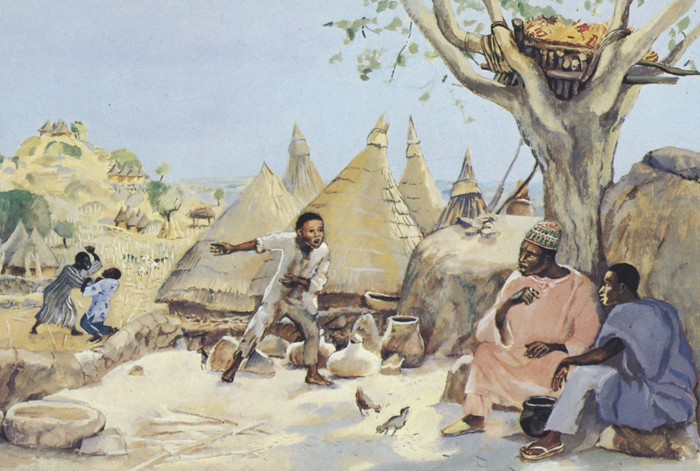 The parable features a king who wants to settle accounts with his slaves. In this parable one of the king’s slaves comes before him, owing 10,000 talents. According to the going exchange rate of that time, this is a lot of money. In fact, that’s as high as ancient accounting methods could go. Just think national debt! You can understand why the servant begs for leniency. There is no way he could ever repay the debt. He offers to repay it, but he knows and the king knows, it is an insurmountable debt. To our surprise the king has pity on the man. The king forgives the debt, without even requiring a token repayment. Think about it: No more IRS letters; no more government agents knocking on the door. Life is good. The question is, will this act of mercy translate into this slaves relationships with those who owe him a debt? The answer is—no. You see, as the slave leaves the court, he runs into a colleague who owes him money. It’s a significant amount, but it’s repayable. You would think that someone who has been let off scot free, would pass on the benefit to his creditors. But, that would not be the case. No, he demands full payment then and there. When the colleague asks for more time, he waves him off and has him thrown into debtors prison. As the story continues, the king learns of this exchange, and regrets having extended mercy to this slave. So, the king brings back the unforgiving servant and rescinds the generous offer of forgiveness, and throws him into prison where he is tortured until he can repay. Of course, that will never happen. So, what lesson might we learn from the parable? Hopefully, we don’t learn that God is a wrathful tyrant! But, might we take from this a word about the relationship between being forgiven and forgiving. Is this not the prayer we offer at the Table each week: “forgive us our debts, as we forgive our debtors?” With this parable, Jesus reminds us that as recipients of divine mercy and grace, we ought to extend the same to others. That is because community depends on forgiveness. The third element of our service this morning is the call to peace. Three years ago we planted a Peace Pole in the circle in the front of the church. 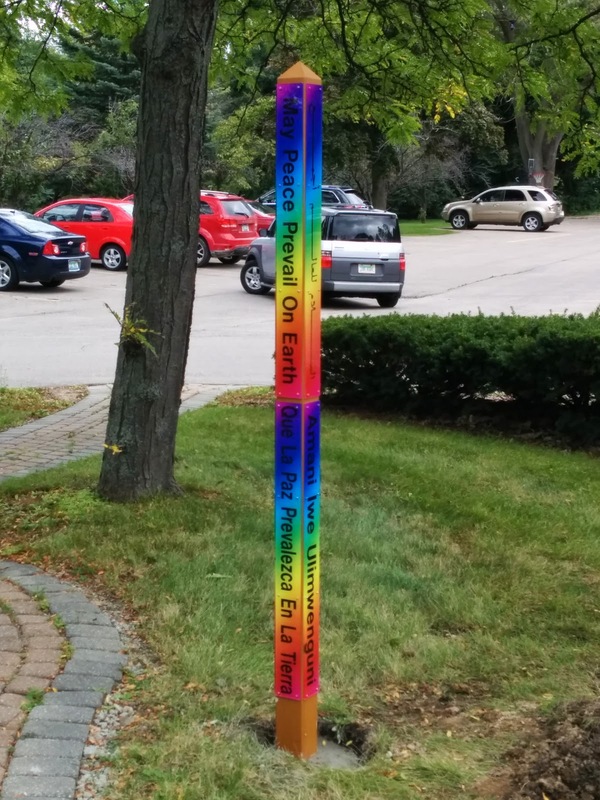 We invited the community to join us in dedicating the pole, because this isn’t just a symbol of our congregation’s desire to experience God’s peace. Much like the interfaith labyrinth at Northminster, the peace pole stands as a witness to the community of God’s desire for all of creation to experience God’s shalom, God’s peace. Our stewardship is a recognition that God’s shalom includes economic justice. The peace pole is a witness to the community, but it is also a reminder to us of whom God would have us be as we live out God’s grace and generosity in this place. I think it’s appropriate to remember that when the church moved from Detroit to Troy in the 1970s, it moved to a predominantly white community. But, over time, Troy has become the most diverse city in Michigan. So, when we think about stewardship, let us think in terms of God’s call for Central Woodward to be a witness to God’s promise of forgiveness and peace from this very room outward to the ends of the earth. The Stewardship Committee met this past week to talk about the upcoming stewardship campaign. We talked about the way in which we should present the budget? We’ve been talking about the use of a narrative budget so we can better connect our expenditures with the mission of the church. While some of you may find line-item budgets fascinating, most of us want to know how our financial resources are being used in support of the mission of God in the world. I will tell you that this isn’t an easy project. It requires a different mind set than we’re used to. The old method is focused on the institution, while the new method is focused on mission. This Monday was an interesting day for me. It started with a trip to Detroit to participate in the Rippling Hope service day. On a day that remembered the attacks of 9-11, Jane and I went into the city to scrape and paint the porch railings for a very grateful woman. Then, I returned to Troy for a meeting with Anne and Kathleen where we talked about how we can live out this congregation’s missional calling in the coming year. Then, in the evening I met with the Stewardship Committee to discuss our stewardship campaign. As I look back on the day, I can see a thread connecting each piece. They’re all related to stewardship. They serve to remind us that this journey to generosity that we’ve embarked upon, involves investing ourselves in God’s realm. It all begins with this word about forgiveness. It is a reminder that we all stand before God as people needing forgiveness, but also needing to forgive, so that healing and wholeness might be achieved. As we come to the Table to receive the signs of Christ’s presence, we will pray that God’s realm will come to earth, and we will receive a word of forgiveness that leads to forgiveness of others, which leads toward God’s shalom. Peace, forgiveness, and stewardship, they’re all related, because they’re all expressions of our relationship with God, with one another, and with the whole of creation. As we’ve seen of late, with the hurricanes and floods in Texas, Florida, and the Caribbean, along with the fires and unusual heat in the West, along with the earthquake in Mexico, when we hear the call to stewardship, it is a call to God-inspired solidarity with one another and with the planet itself. Later this morning we will sing: “Let there be peace on earth, and let it begin with me.” This is a call to stewardship, which begins with God’s word of forgiveness! Picture Attribution: JESUS MAFA. The Unforgiving Servant, from Art in the Christian Tradition, a project of the Vanderbilt Divinity Library, Nashville, TN. http://diglib.library.vanderbilt.edu/act-imagelink.pl?RC=48396 [retrieved September 16, 2017].